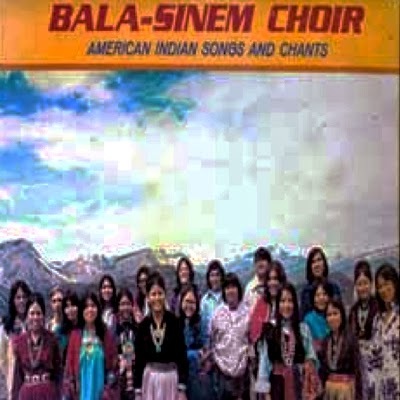 Organized by Mark Romancito, a Fort Lewis College student from the Pueblo of Zuni, the Bala-Sinem Choir serves as the campus Native American choral group. Bala-Sinem is the Hopi word for red people. Each Fort Lewis College student member makes a contribution of traditional music from their tribes. The group, which celebrates its 44th year in 2014, performs for social and ceremonial functions throughout the year. 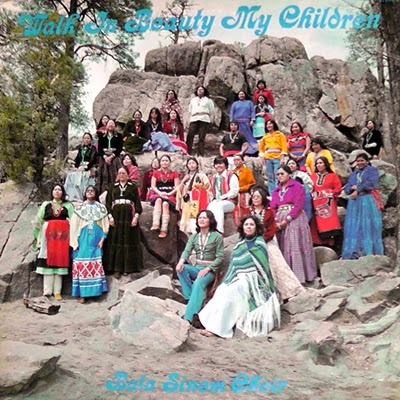 Located two LPs recorded by the group - American Indian Songs and Chants (1973 – Canyon 6110), and the pictured at the top Walk in Beauty My Children (1976 – Canyon 6149). 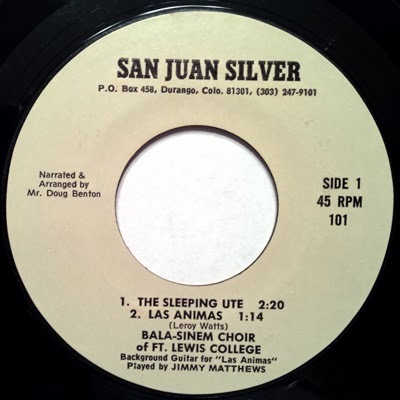 Also found this 45 single EP, on the San Juan Silver record label. There is no date on the recording. The name Leroy Watts appears on the record runoff (and is listed songwriter of the four cuts). A quick Internet search finds that Leroy Watts was a local cowboy poet, who also held a trademark on the name San Juan Silver jewelry (1976). He passed away in 2011. Record is narrated by local disc jockey Doug Benton. Listen to a sample of "The Sleeping Ute"